DoubleClick Publisher Blog: How Many Video Ads are Actually Seen? New Infographic and Research for Video Viewability Across the Web and on YouTube. How Many Video Ads are Actually Seen? 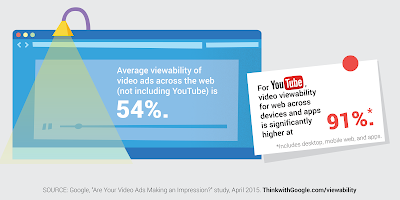 New Infographic and Research for Video Viewability Across the Web and on YouTube. If an ad isn’t seen, it doesn’t have an impact, change perception, or build brand trust. That is why measuring the viewability of advertising matters. It gives marketers a clear understanding of campaign and messaging effectiveness and allows advertising spend to be allocated to the media where it will have the most impact. We have long been advocates of viewability as a currency between buyers and sellers, which is why we’ve had viewable-only buying on our network for more than a year and have been investing in our Active View technology. As a continuation of that effort, today we are releasing new Active View data from across our Google, DoubleClick and YouTube video ad platforms. This new research on the 5 factors of video viewability is being published today on Think with Google to start the discussion about the state of video ad viewability. In this research we found that only 54% of all video ads served across the web, excluding YouTube, had a chance to be seen! On YouTube 91% of ads were found to be viewable. As advertisers shift to paying for viewable video ads, rather than served impressions, understanding the drivers of viewability for video ads is more important than ever. To learn what viewability is and how it is measured, visit our new interactive Active View demo here.